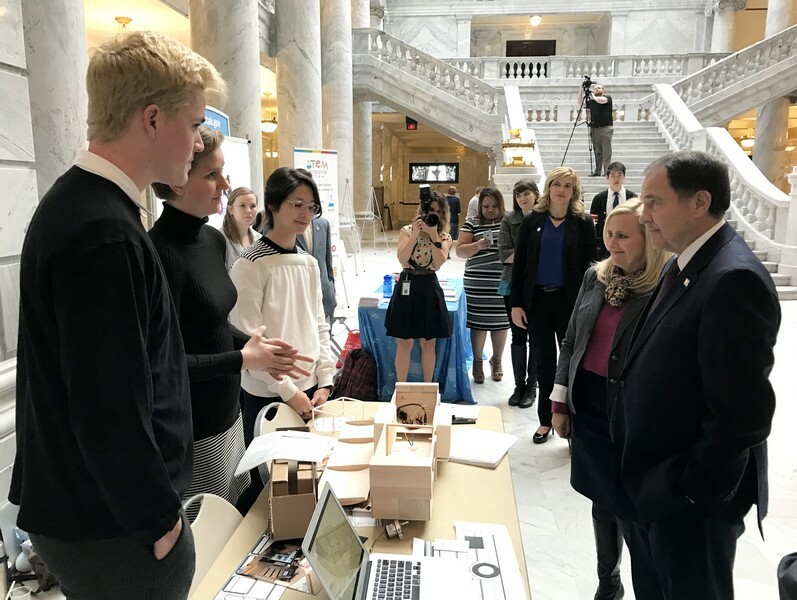 Park City High School students show off their design for a mobile classroom in a bus to Utah Gov. Gary Herbert at an event last week. The students say they had to overcome many challenges to finish the project. 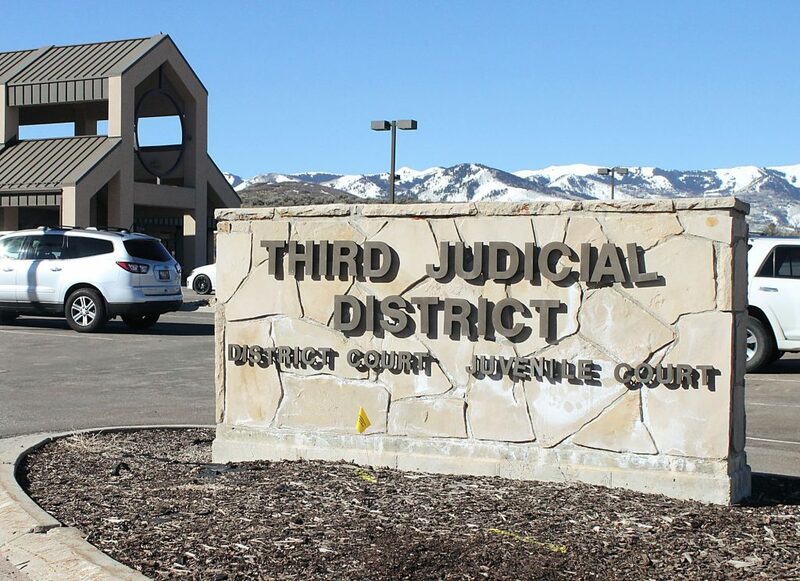 Park City High School students Natalie Haerter, Ishan Chho and Cole Stanton heard from many naysayers. 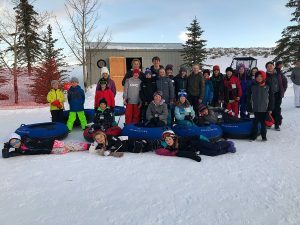 The students had been tasked with designing a mobile STEM classroom out of a bus for their semester-long project in the PCCAPS (Park City Center for Advanced Professional Studies) program. 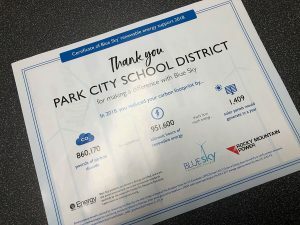 The goal was to create a model the STEM Action Center — a Utah organization dedicated to teaching students science, technology, engineering and math — could build and take to schools throughout Utah. The students, inspired by the challenge, dreamed of something innovative. They imagined a bus with large “modules” that pull out from each side — like many RV campers — expanding the amount of space available for learning. But when they presented their idea to various teachers and other adults, many said it wasn’t practical, or that it would cost too much money. PCCAPS engineering teacher Chris Humbert, however, advised them to push on. And that’s what they did. 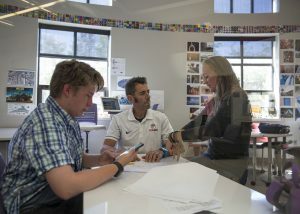 The students completed the project, and once the STEM Action Center can secure the necessary funding, it plans to use the students’ design to retrofit a bus and turn it into the ultimate mobile learning lab, Humbert said. Stanton, for one, said overcoming the doubters made the end result even more rewarding. In addition to dreaming up the slide-out modules, the students designed the bus to be as versatile as possible. Initially, they devoted hours to analyzing what kinds of curriculums the STEM Action Center would be likely to teach out of the bus, in an attempt to mold the design to suit specific needs. But then, they realized it would be more beneficial to make it adaptable to many different uses. That discovery was a turning point for the project, Chho said. Humbert said he initially assigned the project because it provided a stiff real-world challenge. Beyond how pleased he is with the final design, he was delighted to see the students flourish under pressures that are similar to what they would face in an actual job. Haerter said that was the best part of the project. 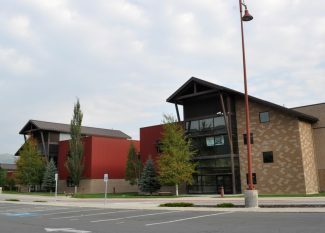 The completed design has earned the students wide-reaching recognition. Last week, they showed it off to legislators and Gov. Gary Herbert during an event at the state capitol building. More rewarding than that, though, was receiving some early feedback from those who may one day use the bus when students on an elementary school field trip wandered by their display.